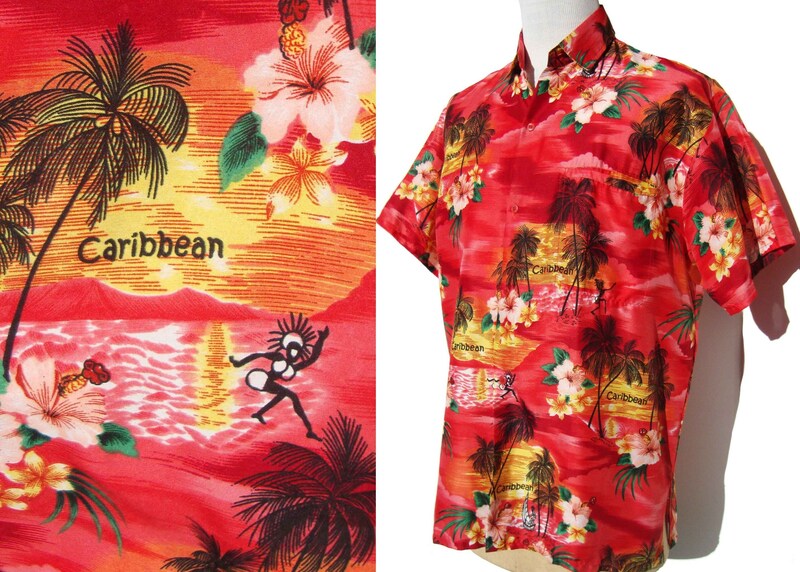 Swaying palm trees and Caribbean sunsets are featured on this vivid men’s vintage shirt with tropical West Indian island theme, by Paradise Collection. The novelty print shirt consists of a treated cotton fabric with a slinky feel or “hand”, and novelty print of palm trees, hibiscus flowers, and small figurals, in shades of red and coral, pink, yellow, green, and black. It has short sleeves, pointed collar, button down placket, single breast pocket, and a label for “Paradise Collection” and a size of “L”, with fabric care instructions on the reverse along with “Made in India”. Very good condition -- vibrant and intact.